Someone with inside knowledge is feeding clues to true crime writer Dougal Lachlan, promising him the best story of his career. Pursuing the story means returning to Twisted Cedars, where he teams up with local librarian Charlotte Hammond. Since the disappearance of her older sister, Daisy, eight years ago, Charlotte has led a quiet, sheltered life. But as Dougal’s investigation proceeds she realizes there is no safe zone. Not even in libraries. And especially not in Twisted Cedars. After a shocking secret is uncovered in Twisted Cedars, Oregon, fresh trouble surfaces when a cargo truck crashes leaving the driver dead and the sole passenger, a woman in her early thirties, unconscious with a severe head injury. When she awakens the next day at the hospital, she is suffering from amnesia. Since she carries no ID, there is no clue as to her identity. Judging by the woman’s bruises, which pre-date the accident, the Sheriff suspects she was running from danger when she hitched a ride with the truck driver. But how can he protect her, when he doesn’t even know who she is? An unexpected connection to a serial killer soon has true crime writer, Dougal Lachlan, and local librarian Charlotte Hammond, trying to solve the puzzle…and prevent further death. When a young boy goes missing the residents of Twisted Cedars are in a panic. They would be even more fearful if they knew a serial murderer has secretly moved back to town. True crime writer Dougal Lachlan and the local librarian Charlotte Hammond must work together with the Sheriff in order to finally expose the killer responsible for decades of unsolved murders. 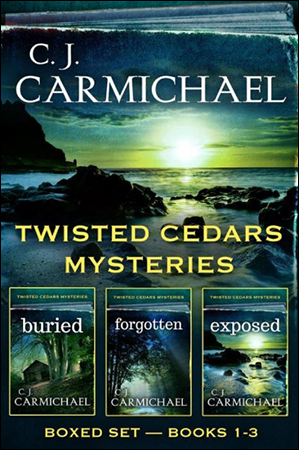 Many of you have told me you wish the three Twisted Cedar Mysteries were available in one place. Well now they are! We decided to release this complete Anthology so that you could have a reading experience that flows seamlessly from Buried to Forgotten and finally to Exposed, where the last loose end is finally wrapped up. Welcome to Twisted Cedars Mysteries. I hope you enjoy the journey!